If you’ve been reading our series, you probably learned a lot about cables. You’ve learned how a well-built cable with a firm connector can keep your signal nice and strong while a poorly built cable can cause problems. But what about the different types of cables in the house? What’s the best choice? In order to figure out what kind of cable to use, there are two things you need to know: What frequencies you’re using and how long the run is. If you know those two things, you can figure out which cable to use. This is an easy answer, since radio stations are required to announce their broadcast frequency. AM stations broadcast between .5MHz and 1.6MHz (they list their frequencies in kilohertz, and each kilohertz is 1/1000 of a megahertz). FM stations broadcast between 87MHz and 108MHz. Broadcast television stations in the US use the VHF and UHF bands between 150MHz and 850MHz, roughly. Before the digital transition, broadcast stations also used the VHF low band between 50MHz and 90MHz, roughly. You may have wondered how cable and satellite can offer thousands of channels. They use a LOT of bandwidth. A cable or satellite signal can use frequencies from 2MHz to 3,000MHz. That’s why you use high-quality cable for satellite TV runs. When it comes to cable length, a lot of it really depends on your situation. If you are using a small radio, the antenna is attached to the radio, so cable length is zero. So, we’re not going to really discuss that. If you’re using an indoor antenna, your run is generally under six feet. If you have a roof-mounted broadcast antenna or satellite dish, it can be up to 300 feet from one point in your house to another. And, with cable TV, the run is generally coming from a tap somewhere in your neighborhood so it can be even longer than that. Let’s look at some cables and how they fare. I chose 500MHz because it’s right in the middle of the broadcast TV range. If you look at the numbers, you can use pretty much any cable for a five foot run of antenna wire. Why? Because even the slimmest cable loses less than .1dB more than the fattest. In other words, the slim one carries about 1% less voltage. Of course, there are other factors to consider like shielding, but in terms of pure voltage carried, you can use anything for an antenna run of that length. On the other hand, the losses start to mount up with a 300 foot run. They’re not so bad for 50 feet, which might take you from the roof to the TV. But start running an antenna all over the house and you are losing 7.5dB more signal with the slim cable. Considering that the losses run from 13.5 to 21dB, that means that if you’re using slim RG-59 you’re losing over 99% of the signal. Let’s look at the numbers for 2500MHz, which is a frequency that might be used for cable or satellite. For 5 foot runs the lengths are still pretty reasonable. The loss for the slim cable is about double that of a good RG-6 cable, though, and that alone makes it worth staying with RG-6 for cable and satellite. The news gets worse from there… slim cable is a really bad choice for long runs! It loses over 50dB which means that you are losing 99.999% of the signal. Even RG-6 cable has a rough time over a really long run like that which is why we recommend amplifiers for long runs. An amplifier can put 25dB back into the line which comes close to compensating for the 31dB loss you’ll get over a perfect run of 300 feet. Let’s take a basic question: Is it ok to use “Slim RG-59” cable for an indoor antenna? I tested two antennas here and they both came with really skinny wires about 6 feet long. Is that ok? The easy answer is, absolutely. These cables are not expected to carry cable TV, and at broadcast TV frequencies the amount of loss is really small no matter what kind of cable you’re using. And… is it ok to use RG-59 cable for a satellite setup? Just going on the signal loss numbers, you can expect performance to be worse with RG-59 cables. Signal loss doesn’t tell the whole story though. There’s also shielding, for example. An RG-59 cable may only have a single shield and that may make a difference over a run of 100 feet or more. 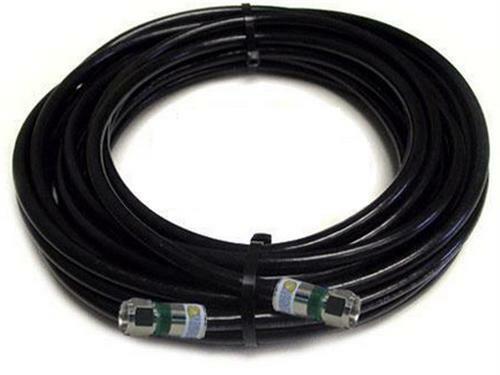 It’s best to stay with double-shielded cable for the super-high-frequency information of a cable TV or satellite setup. If you’ve read this whole series, you’ve learned a lot about cables, and how and where they should be used. Now, take a look around. Are you using the right cable for the job. Are all your connectors clean and firm? Are all your sources of insertion loss as small as possible? Take some time to know your system and you’ll be amazed! How can I guarantee that I’ll get equipment with the new DIRECTV logo?